Gigi's Thimble: A Giveaway From Me 2 U! 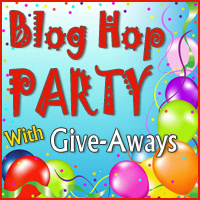 There's a blog hop party goin' on right now and I couldn't resist joining. But first, let me say "thank you!" Thank you for taking the time to stop by and read this blog. Thanks to those of you who take a minute from time to time to leave a comment. It really makes my day and makes all the time I put into this ~ worth it. I really enjoy blogging. I get so inspired when cruising around Blogland. It makes me happy to get a little bit of "eye candy" each day. It feeds my creative soul. I started this blog, thinking that if I could do the same for others ~ then fabulous! So this giveaway is for all you (my followers). THANK YOU. PLUS a few other little goodies. Just leave me a really nice, sappy comment below (j/k). Please make sure you're a follower. This giveaway will end December 17 at midnight. P.S. If you need a last minute gift there are two more pillow covers and a couple of new pennant banners up in my shop right now. PRETTYPEPS11 at checkout for 20% off that pattern. Love the dresden plate pillow...I enjoy reading you blog too! I just love Dresden's These pillows are beautiful. On my list of things to do.. Dresden quilt, cathedral windows quilt.. oh so many more..Thanks for having such a great giveaway. Oh my gosh, those pillow covers are adorable!!! One would look perfect on my rocking chair :) Happy Holidays! Ohh such a pretty and festive pillow cover. Hope you have the merriest Christmas this year! Thanks. I am a follower and I love this pillow cover and pattern! Thanks for your generosity! I would love to win this giveaway. It would be a Christmas gift I would actually enjoy for myself instead of the typical Itunes card my husband gets me for every holiday (birthday, valentines, X-mas) Literally! Haha! I hope you have a Wonderful Christmas & Happy New Year! oh, i've definitely been wanting to jump on the dresden plate bandwagon, so i would be really excited to win this! I love your patterns!! The pillow cover is just way too cute. I would love to win the darling DP pillow. I am a follower. I follow your blog! I love your pillow!!! Oh wow, I really really want to win these. But I don't think the #1 commenter ever wins anything :( Ha! Thanks!!!! I just love Dresden plates. They look so festive in red and green. Thank you for your terrific blog! I'm a follower. You put it so succinctly - the reasons why I too blog!!! I love sewing, quilting, crafting etc and there is so much inspiration out there. I love following your blog because your ideas are so fresh and beautiful. Your blog brings joy to my day!!! Thank you. I love your arrow quilt pattern so much it seems that I can't remember the name... Happy Christmas! Love the dresden plate pillow covers. I am a follower. Would like a chance to win. thanks! I am also a follower- all your patterns are great. Merry Christmas. Can't get enough Dresdens! Would love to be snuggled under a Pretty Peppernits quilts with my sweetie while watching White Christmas. How did you know that your dresdon quilt was already on my list for 2012? LOL. I can't wait to make my first block! I'm saving a corner on the couch for your pillow- just in case! :) Thank you for the chance at such a lovely giveaway! I love dresden plates but I haven't made one yet!! Oh I love that pillow! and I would love to make the quilt. So I guess I better win! I'd love to have that pillow in my living room right now! It's beautiful! I love your blog and your patterns. I am a follower! I follow you because I love your patterns! the pillow cover is beautiful. Now i better go get my posting up. Merry Christmas! I am a follower, and I love the Dresden plate pattern in Christmas colors! I seem to have a thing for Dresdens but I've never made them. I'm new to quilting. I hope to get a dresden ruler for Christmas! The pillow is lovely! I'm a follower and would be proud to own your pretty Dresden plate pillow cover. Your Pretty Peppermints quilt is adorable. Thanks for all you do to make your blog such a fun read. What a beautiful pillow cover! Hi Ambs! I LOVE the pillow cover! Your Christmas patterns are gorgeous! I hope you're enjoying your hoiday season. Love the pillow covers. Thanks for a beautiful blog. Your Dresden Pillow is so sweet! Love the colour combinations, very striking! I love your patterns, and the pillow form. I just recently discovered the blogging world (late to the party, I know), and I love your Tuesday Tips series! Thanks so much for the giveaway! Come sign up for mine, too! Love that pillow cover, Love Pretty Peppermints too! Thanks for the chance to win. Long time follower loving the dresden! What a darling blog! Love the dresden plate pillows too! What a darling blog.I love your dresden plate pillows too! So now I have my fingers crossed and toes too hoping I will by the lucky winner! Sweet! would love to find a place in my for it. I love your work. The pillow is beautiful. Thanks for the giveaway! I love the peppermints so cute. I am a newer email subscriber and appreciate the time and energy you put into your blog. ;) I haven't tried a dresden pattern yet but it is on my to try list for 2012. Thank you for the chance to win. Merry Christmas! I have been following your blog for quite awhile now and I am always totally blown away by the creative talent of you young ladies -- lots younger than me anyway! I haven't tried a dresden pattern so would love to be a lucky recipient of one of those lovely pillows. THANKS -- have a wonderful holiday. LOVE the pillow cover! Dresden plate is one of my favorites. I love your dresden pillow, it's at the top of my to-do list but I'm quite intimidated by the complexity. Thanks for a lovely giveaway, I'm a follower. I have enjoyed your blog for a while now via rss feed and as an email subscriber, your inspiration is inspiring. Oh Amber, I just love that pillow...I was bummed to have missed you at the big craft fair in Portland, I bet there was a lot of fun stuff. I hope you and your sisters had a wonderful time! Take good care and have a very merry Christmas! Greetings from Norway, I Love your pattern and would be happy if you picked me. What a lovely pillow. Love dresden plates! I am a new follower and I am looking forward to read more! Thanks so much! Thanks for the give-away! I'm fascinated by the Dresdens. I made a 1930s repro quilt with a big double Dresdan as the center medallion block, but I think it's almost time for one with lots of smaller Dresdans in some wild colors. That pillow is gorgeous and would suit my sofa perfectly - pick me, pick me, pick me!!!! hmm lots of nice eye candy on your blog - guess I better become a follower - be seeing you again! I would love to win so please include my name! And come and visit me to see what I have up for grabs! You will be glad you did! Dresden's are one of my favorites of all time! I would love this pillow. Thanks for the chance for all of your goodies! I've been reading your blog for a while, but finally became a follower. Thanks again! cute stuff! I'm a new follower and would love some free stuff! who wouldn't? That pillow and pattern is adorable!! And I love your work on the Moda Bake Shop!! Maple syrup...how's that for "sappy"? :) Thanks! What an adorable pillow!!! Thanks for such a generous giveaway. I am simply fascinated with your Christmas Dresden quilt pattern! That is one pattern I have not tried, and it looks so beautiful in those Christmas colors. I will put it on my list for next season. Love your blog and all your wonderful ideas. Thanks for sharing! What an adorable pillow. So cute and cheerful. Love it. OK, I am so not good at snapy comments, I just finished working all night and am all out of snap at the moment. I am a new follower. thanks for the chance to win. the pillow is just wonderful. Oh my gosh that is so so pretty! I love love love your giveaway! and I am a happy follower! Hello I am a new follower. I love your cushion and really like the pattern. Thanks for the chance. I just found your blog at the Quilting Gallery and I'm a new follower. Love the peppermints - so cute! I love dresden plates but have never made one. It's definitely on my bucket list. What a great giveaway! I'd love to have a chance, and thank you! I'm your newest follower. you have a wonderful blog. I love dresden and your pillow would make the perfect Xmas gift...for me ! Your quilts are beautiful!!!! Love the pillow in the giveaway. I have a sentimental attachment to the dresden plate pattern as it was the first pattern I ever made. A friend and I made it using cardboard templates and scissors so that is how long ago it was. I love the pretty pattern you created with them. What a lovely Christmas surprise this would be. Thanks for the chance to win. I've only done a Dresden once. Yours is lovely! I love the pillow covers they are really great looking. I try to go to blog land at least once a day just to see what is going on. I follow a lot of people so it takes me a while to get to everyone but I will. Thank You for such a wonderful giveaway and Happy Holiday to You and Yours. I love the pillow! Thanks for giving one away! Thank you for the great giveaway!! I love the pillow. It's gorgeous!! I'm already a follower!!! I just ordered a dresden ruler on Amazon and can't wait to use it! I love your pattern too. You have modernized an old tradition in the most delightful way! Aloha from Hawaii and Cheers! Hi I am Jeanne a new follower, nice to meet you. Have you been over to my giveaway yet? I love what you are giving away. I so hope I win. Who wouldn't love to win the darling dresden pillow cover. Count me in! I'm a new follower. Do you have an RSS feed? I love polka dots, that's my thought for a comment. Gorgeous pillow!! Thanks for the opportunity to enter your great giveaway!! Love dresden plate pattern. Thank you for the giveaway. I was happy to find your blog through the giveaway and I am a new follower. I love the dresden pillow! I love the Dresdan Plate Pillow cover - and loved the bias binding tutorial. I'm using it to bind my first large quilt. Cute pillow. Would love to wing this. I follow, I dream with inspiration and I love the pillow. Thanks for a great opportunity to enter. Beautiful Dresden plate which would look great on some of our pillow-less furniture. Thanks for the giveaway. I already follow your blog too. I love the pillow! Thanks for hosting a giveaway. Happy sewing! I'm a new follower to your blog. Thanks for the inspiration and great patterns! Thank you for the give-away. Have a lovely Christmas! Gorgeous giveaway. Thank you for being so generous. I have tried to become a follower but it wouldnt let me. I will be back to try again in a couple of minutes. Beautiful pillow. Thanks for the giveaway! Your dresdon pillow is a keeper. Thank you for your generous gift that some lucky winner will receive for Christmas. Your bloggers get as much satisfaction from reading and learning as you get from us. I enjoy your blog and I want to wish you a Merry Christmas. first time to visit your blog. I love it. love the pillow! I have to have it. LOl.. I just became a subscriber to your blog and on pinterest! 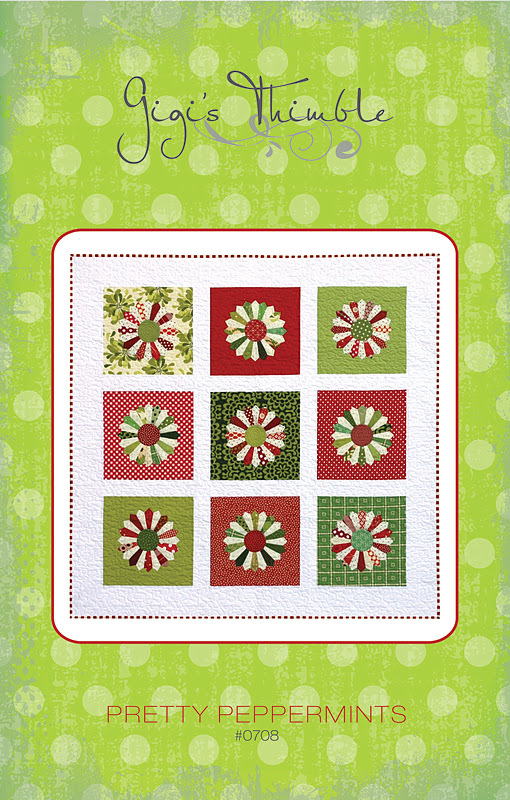 I love our pretty peppermints pattern! Dresden's are one of my very favorite patterns of all time!! Love,love, love the Dresdan pillow! Such pretty fabric colours. Thanks for your generosity. I really love your pillow! Nice job. The pillow cover is adorable! Thanks for a chance to win. Merry Christmas! LOVE the pillow and pattern! Thanks for the giveaway chance! super fun giveaway :) Thanks! Sappy? :-) How about how my great grandma made a dresden plate quilt and, along with double wedding ring I've always had it in my head that its THE quilt pattern? I love this pillow! Thank you for the giveaway and I love your blog! I am a new follower of your blog and I love your pillow. Thanks so much for the opportunity to win. How pretty! My elderly mother in law would love it! She quilts as much as she can with her eyesight, and has gotten me interested now. I love Dresdens! I have only done half of one so far. Your peppermint dresdens look so fun. Happy holidays! Beautiful cushions, I would love to win. You did a wonderful job on ther pillow covers! It is so stunning! What a great giveaway. My niece is expecting her second child soon. He'll be my 91 year-old father's 12th great grandchild. Thanks for the chance to win. Your quilt and pillows are so festive, I'm following you. Tis the season to give and receive gifts and I would be so happy if you would gift me this prize. Very nice things that you are giving away! I am a follower. Looking at your pretty pillows and peppermint dresdens make my mouth water for a peppermint humbug..as children on a journey between our home and our grandparents the year my father died, Dad kept us (3 kids all under 6) quiet and happy by promising us each one of the us a delicious striped peppermint humbug which he showed us before depositing them in the glove box of our little blue VW, one every 77 miles. We had the distance of at least 4 hundred miles to travel and I recall it was effective for a good distance..a sweet can go a lot further if you concentrate! I'm a new follower! That pillow is just too wonderful! Your Dresden plate pillow covers are beautiful...I would be so proud to win one...enjoyed reading your blog and I became your follower. I look forward to visiting you often...have a Merry Christmas. I love Dresden's but they scare me a bit for some reason! Haven't tried them yet! Your pillows are lovely! I'm a follower on Reader, have been, since finding your blog through Moda Bake shop. I haven't tried a Dresden plate yet, but I LOVE that pillow cover. Thanks so much for the chance to win. Merry Christmas to you!! Your pillow covers are beautiful. I love seasonal things that can float thru valentines. Have a merry Christmas. Green - there is nothing more to say - I just love green and frogs but the frogs more because everyone else doesn't like them. I espcially like the fresh spring colours, not the usual christmas shades. Which means I could just look at it all year. Oh my, the pillow is beautiful! Thank you for sharing your talents and for your very generous giveaway. Happy Holidays. Cute pattern! I would love to try dresdens and it'd be motivating to have the fabulous pillow cover to model after! Those Dresden Plates look great! LOVE that pillow cover! And thanks for the code to the shop. I'm done with my Christmas shopping, but there is always room for one more gift under the tree! And, of course, I am a follower! I LOVE YOUR WORK!! The pillow cover is just perfect - and I'd love one of your patterns. Thanks for the great giveaway! I love the pillows. So cute. what a beautiful pillow cover, I remember my grandmother making them, as for me I have not attempted them yet. What a pretty pillow and quilt. Thanks for the opportunity. I am a new follower. Pretty Dresdens is awesome. I'm already a follower. I made a dresden quilt for one of my grandbabies a few years back in pink/brown...it was so elegant. Dresdens are such a great block! Love the dresden pillow and your blog. I am a first time visitor. I follow you now and look forward to staying in touch. Love the pillow cover. Sweet! Thanks for sharing. Cutest pillow ever! Love it! New follower here, what a BEAUTIFUL blog! Love the pillows! Thank you! What a beautiful pillow and great giveaway! I am a follower! Thanks! I love your pillow and appreciate the opportunity to enter the giveaway. I am also a follower. I'm a follower and I love your patterns. I've never done dresdens, but that quilt is so stinkin' cute I may have to step out of my comfort zone a bit! Just found your blog and I LOVE IT! I am loving your patterns, maybe Santa will buy me one (or three) for Christmas! I'm a new follower, and I look forward to spending more time on your site! If I win this giveaway I will be soooo happy!. Thank you for the chance! Love your pillow. I have never tried the dresden plate pattern yet. Something sappy-Quilting has brought me so much besides the actual quilt. Wonderful friends. I LOVE reading your blog! You are so creative and a great inspiration! I love the dresden plate pillow covers! I've only made one dresden plate in my lifetime and want to make some more! I hope I win! I love those pillow covers! I just love the pillow. Thanks for the giveaway and congrats to the winner. I love Dresden's. Thanks for the great giveaway. Hi Amber the Dresden is my all time favorite block still even after all this modern new stuff Dresden is still the favorite....And I really love your peppermint pattern very pretty and inviting...Happy Holidays.. Your patterns are great Amber!